A high school security guard, who is addicted to video games, in Atlanta, GA has two goals in life; marry the woman of his dreams and become a cop. There is one obstacle that stands in the way of both goals coming to pass; his lady’s imposing cop brother. 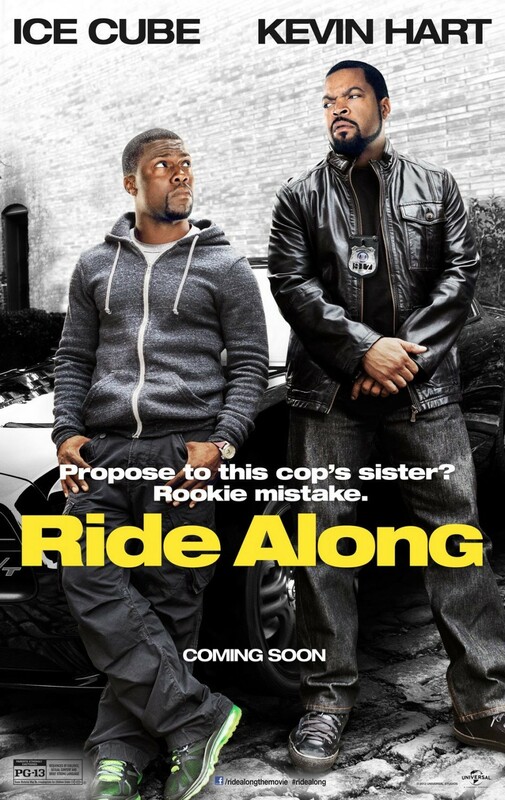 Ride Along is an action comedy starring Kevin Hart and Ice Cube that is equal parts Training Day and Kevin Hart stand-up. Right from the start you realize that this movie is all about being entertaining with little regard placed on being award worthy in any category. The two main characters, loner badass cop, James Payton (Ice Cube) and wise-cracking school security guard, Ben Barber (Kevin Hart), are total opposites and over-the-top in their own unique ways. They remind me of the characters from the old 48 Hours movies played by Eddie Murphy and Nick Nolte. James decides to take his soon to be brother –in-law out for a ride along that will also serve as Ben’s “training day.” Ben has to prove his worthiness of being a cop and marrying James’s sister Angela. The movie unfolds as a series of “126 in Progress” calls that Ben is tasked with handing to see if he can make the cut. The circumstances that he is placed in and the consequences of their actions are hilarious almost to the point of being totally ridiculous. The potential comedic chemistry between Ice Cube and Kevin Hart was a point of concern for me going in. After seeing the first on-screen interaction between the two, those concerns were quickly put to rest as they “clicked” right away. Ice Cube and Hart were a truly dynamic pairing when it comes to gaining a laugh. Kevin Hart played up his short stature and addiction to video games for several good laughs. Ice Cube worked as the straight-man for most of the movie, but also got to interject some of his own comedic and note-worthy lines. I even had a Gangsta Rap geek-out moment when Ice Cube delivered his famous lyric “Today Was a Good Day” after a particularly funny scene. Despite the simplistic story, I do recommend seeing the movie if you are in the mood for a few good laughs AND are a fan of Kevin Hart. If you find Kevin Hart even a little annoying, he is in full force in this one. Consider yourself warned.